You guys! I made these delicious Sweet Potato Coffee Cake Muffins. They taste like a sweet coffee cake, but they come with hidden serving of veggies! My kids had no idea and ate them up. I promise you will devour them too. I mean, just look at that crumble topping! They go perfect with a cup of coffee. 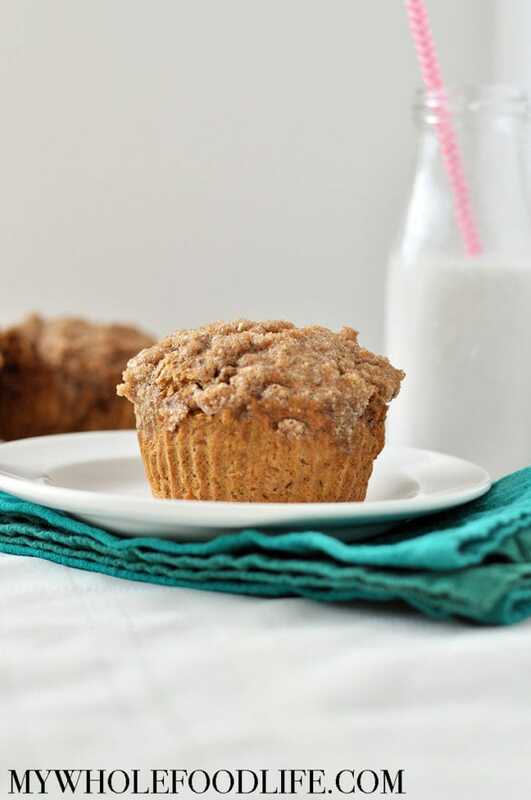 These healthy muffins are vegan and gluten free. Free of refined sugar, but full of flavor. I added nice spices like the cinnamon, nutmeg and ginger that will leave your kitchen smelling like Fall. I made my muffins jumbo sized, but you can make regular muffins as well. However, the cooking time in the recipe will be for jumbo. You need to cut down the cooking time for standard sized muffins. The perfect bite with a cup of coffee. It even comes with a serving of veggies! In a large bowl , mix all the dry ingredients for the muffins. In another bowl , mix the wet ingredients. Spoon batter into lined muffin pans . I used jumbo sized muffins. If you use standard size, the cooking time will be less. To make the crumble, mix the crumble ingredients in a small bowl. Sprinkle a little on top of each muffin. Let cool before removing from pans and storing. These should last at least 2 weeks in the fridge and even longer in the freezer. Enjoy! Do you think coconut flour instead of oat flour will work here? Unfortunately, coconut flour is very hard to sub in recipes. It's best used only in recipes written for it. Can the sweet potato be steamed or boiled instead of baked? The crumb topping looks amazing! On my to-do list this weekend - thank you! These sound fantastic. Can't wait to try them. These muffins look so good! I love the idea of using sweet potato instead of the traditional pumpkin puree. Your "print" button never works for me. Hi Judi, I'm sorry you are having in issue with it. Can you try taking a screenshot and printing that? Didn't have sweet potato, so subbed pumpkin purée and pumpkin pie spice in place of other spices. Yummy and my 7yr. old daughter said they were perfect and her favorite!! Thanks! I wonder how Aquafaba, instead of flax eggs, would work. These muffins are delicious! I am not a sweet potato fan but these may have one me over. Thank you for all the great recipes you create!! So glad you liked them Brenda! You are so welcome! Can I sub regular eggs for flax eggs since I'm not vegan? I've made these multiple times. I love them & have shared w/ others. Always a hit. 1 flax egg is 1 tablespoon flax and 3 tablespoons warm water. Stir and wait a minute for it to get gummy, like an egg.